Although nearly a decade has passed since Hurricane Katrina wreaked havoc across the U.S. Gulf Coast, signs of its fury are still clearly visible. Nothing speaks more directly to Katrina’s destructive power than the tens of thousands of rotted, weed-choked vacant buildings—some still branded with the crosses painted on their exteriors by search and rescue teams from the Federal Emergency Management Agency, or FEMA—that dot the Gulf Coast. These abandoned houses are a stark reminder of residents who struggled and yet failed to return home. In the 10 years that have passed, many of these former residents are part of an underreported but growing population of the domestic climate displaced. A decade after Katrina, thousands of the hurricane’s victims have yet to return to home. In 2005, an estimated 1.5 million people from Alabama, Mississippi, and Louisiana fled their homes in the face of Katrina. Roughly 40 percent of the people who left, particularly those from Louisiana, were not able to return to their pre-Katrina homes. Only 25 percent of Katrina evacuees relocated within a 10-mile radius of their previous county of residence; another 25 percent relocated more than 450 miles away; and 10 percent relocated to areas at least 830 miles away. These data for Hurricane Katrina victims exist, in part, because of the large number of people who were forced to flee. The Katrina exodus was the largest U.S. movement of people forced to migrate because of a climate event since the Dust Bowl of the 1930s. The scope of the Katrina tragedy and the vast and unprecedented need for federal assistance underscored the necessity of identifying where people moved and what services they needed. Extreme weather continues to displace people, but despite the passage of 10 years since Katrina, it is no easier today to determine just how many climate-displaced people there are in the United States or where they are located. Extreme weather disasters are on the rise. Scientists around the globe have concluded that climate change is exacerbating extreme weather, from heat waves and droughts to heavy rainfall and floods. The authors of the U.S. National Climate Assessment conclude, for example, that increased ocean temperatures due to climate change can make hurricanes more frequent and intense. A recent report by the Norwegian Refugee Council found that globally people are 60 percent more likely to be displaced by a weather-related disaster today than they were in the 1970s. Recent history seems to coincide with these predictions. In the 10 years since Hurricane Katrina, there have been 632 “major disaster declarations,” a FEMA designation that signifies a naturally occurring event that is “beyond the combined capabilities of state and local governments to respond.” In the 10 years prior to Katrina, FEMA made 529 major disaster declarations—215 more than the previous decade. In fact, the United States has already experienced nearly as many major extreme weather disasters in the first five years of the 2010s as it did in the 1960s and 1980s combined. The rising number of extreme weather events, coupled with news accounts of ensuing climate displacement, indicates that climate displacement is occurring on a yearly basis and is likely to become an even more pressing challenge as the climate changes. Finding and assisting climate-displaced people, particularly the most economically vulnerable populations, are key to helping the displaced regain their economic footing. When low-income individuals must evacuate due to extreme flooding, their homes may suffer greater damage because they were less climate resilient in the first place; they may not be able to rely on the generosity of family or have financial resources to withstand even the most temporary setback; and wage-based jobs, which are often held by low-income people, are also at risk in the wake of an extreme weather event. Furthermore, post-disaster reductions in affordable, habitable housing stock can make it difficult for low-income residents to afford to return. Returning home can be an important step for the health and economic stability of low-income, climate-displaced families. Evidence indicates that the climate displaced, particularly those who are low income, can suffer from greater hardships than they did prior to evacuation. For example, the individuals most affected by Katrina were less likely to have completed high school, and, once displaced, they were more likely to suffer from mental health problems. Additionally, the Katrina displaced had fewer opportunities for economic mobility than they did prior to the hurricane. Researchers also found that more than one-third of Katrina’s displaced children were at least one year behind in school for their age. Strengthening the opportunities to return home can minimize the disruptions of work, affordable housing, schooling, and health care that affect the low-income climate displaced. Even if policymakers cannot help the climate displaced return home, they can help bring resources to the places where the displaced have relocated. This can help offset some of the negative impacts of displacement described above. Resources include government assistance for housing, increased education aid, or medical assistance. For example, Houston, which took in the largest number of the Katrina evacuees, had to request financial aid from federal housing and education agencies to support the displaced. As smaller scale climate displacement happens throughout the United States, federal agencies should be aware of where climate-displaced families are headed and offer resources that can help them find homes and schools in those locations. As noted previously, Hurricane Katrina was the largest weather-displacement event in modern history, but it was by no means the only such event. In the past decade, extreme weather events have displaced an estimated hundreds of thousands of people throughout the United States. The lack of precise information on the exact number of people who heeded evacuation orders, the amount and type of damage to housing stock, and the length of time people were unable to live in their homes makes it difficult to establish how many people were displaced and for what period of time. However, the events listed below show that thousands of people were forced from their homes, if only temporarily, in each of the past 10 years. These examples focus on flooding alone, but wildfires and extreme drought can also trigger climate displacement. Flooding in the Mid-Atlantic states caused an estimated 200,000 people to evacuate southeastern Pennsylvania; at least 1,000 people to leave Rockville, Maryland; and approximately 15,000 individuals to evacuate Binghamton, New York. Iowa suffered $10 billion in damage from record flooding that prompted the evacuation of 270 homes in the Des Moines metro area and an unknown number of evacuations in surrounding region. One year after the flooding in Des Moines, more than 1,000 families were still unsure whether their damaged homes would be purchased by the government via voluntary sale or repaired. The damage was severe enough that the city spent $1.5 million to relocate residents and acquire or demolish vulnerable properties near the Four Mile Creek area. The flooding of several rivers led to evacuations in Tennessee, North Carolina, Kentucky, and Georgia. The Red River also flooded that year, forcing thousands to evacuate Fargo, North Dakota—the state’s largest city. Rising waters displaced 10,000 Tennesseans from their homes and ultimately damaged or destroyed almost 11,000 properties—more than half of which were outside what was then considered the 100-year floodplain. Floods forced the evacuation of 11,000 people in Minot, North Dakota. It was the second time such a large number of people had to evacuate that year. In March, flooding of the Missouri and Mouse rivers damaged 4,100 homes, 3,100 of which were extensively damaged or beyond repair. Superstorm Sandy struck the East Coast in 2012. Official estimates of how many people were displaced ranged from 10,000 to more than 40,000 people—“a very rough approximation,” according to the New York City mayor’s office, because it only reflected the number of people in government-run shelters. A recent report estimated that there are still 39,000 displaced people in New York and New Jersey three years after the storm. Flooding displaced more than 11,000 people in the Boulder, Colorado, area and up to 100,000 people throughout the state. Six mobile home parks were flooded, damaging more than 1,000 mobile homes and destroying 280 of them. Flooding, which resulted in major disaster declarations in Arizona, Nevada, and New Mexico, led to the evacuation of at least 500 people. May flooding in central Texas damaged more than 1,000 homes and washed away between 350 and 400 homes, leaving more than 1,000 people in shelters. The above data highlight extreme weather events that forced people to leave their homes, but there is a lack of information about the number of people who were able to return. Additionally, these numbers only represent a portion of the U.S. population that was forced to flee from extreme weather events. While the examples above focus on displacement by floods and storms, there are other causes of climate displacement. Thousands of people had to evacuate Washington and California in 2014 due to wildfires sparked by climate change-exacerbated drought. Furthermore, climate displacement is not only the result of a sudden traumatic event but can also happen slowly over time. Drought or the constant flooding of low-level areas can prompt people to leave because they can no longer farm on parched land or repair ongoing water damage to their homes. With extreme weather events on the rise and evidence that thousands of people are being displaced each year, why is it so difficult to find out who is most affected by extreme weather and how to help them recover? One explanation may be that people who are forced to evacuate their homes often use personal networks of friends and family to find temporary shelter. When such displacement lasts a few days, or even a few weeks, it may not significantly affect the displaced or their hosts. Even if displacement lasts longer than a few days, without a reporting system or use of government resources such as public shelters or emergency benefits, such displacements may be largely unreported. Low-income residents who lack a social network to support their displacement are less fortunate. Those who cannot navigate government bureaucracy, afford new rental housing, or purchase necessities such as food, clothing, and shelter can find themselves in peril. These people and others—who may have mental health difficulties, be wary of shelters, have language barriers, or simply be unaware of existing benefits—can have the most need but the least access to resources to help them rebound from extreme weather displacement. Moreover, since disaster spending tends to follow the disaster rather than the displaced, climate-displaced individuals can find themselves much worse off than they were before the extreme climate event. By tracking the climate displaced, policymakers and governments can help provide temporary or permanent housing benefits, share specific information on how to restore homes, return people to their neighborhoods, or accommodate the displaced in their new environments. While this will not prevent residents from being evacuated during an extreme weather event, better data collection would help prevent the physical and economic tolls that occur when extreme weather suddenly uproots people from their lives and livelihoods. Moreover, local governments would be able to move public financial resources away from emergency housing or long-term care and toward climate resilience measures that prevent climate displacement in the first place. If climate-displaced people unwillingly disappear from their neighborhoods, not only are they done a great disservice, but the harm to local economies can be monumental as well. After Hurricane Katrina, the loss of people and employment in the affected region resulted in delinquent mortgages, a shortage of oil workers, and long-term economic hardship for New Orleans and Gulfport, Mississippi. Host communities are affected as well. When Houston became the largest host of Katrina victims, the city required at least $130 million in emergency funding to house the displaced. There are a number of actions that city, state, and federal leaders, along with private-sector actors, can take before and after extreme weather events to minimize the impact of climate displacement. The best way to prevent climate displacement is to increase climate resilience. Prior to a climate-related disaster, city planners, the Army Corps of Engineers, FEMA, National Oceanic and Atmospheric Administration officials, other relevant agencies, and climate experts need to be sufficiently funded to allow for the mapping of flood-prone areas and to support resilient community design. This type of mapping can help guide where people are most likely to be affected by extreme weather and help policymakers and officials form plans to increase resilience in those areas or, at a minimum, ensure a safe evacuation. At the same time, governments should make long-term investments in protecting homes from extreme weather, for example weatherization and water-absorbing natural infrastructure improvements, to help mitigate future risk of displacement. City and state evacuation plans should consider temporary housing options as part of an extreme weather exodus. Cities that are more likely to take in evacuees—those that are near climate vulnerable areas and offer housing and other infrastructure that could support an influx of hundreds of people—should consider how to shelter and integrate the potentially climate displaced before an extreme weather event occurs. Additionally, Congress should help localities strengthen the quality and resilience of affordable housing by investing in the expansion of such housing before disaster strikes. After a disaster, voluntary buyout programs can be more cost effective than other climate protections and, if well designed, can restore vulnerable coastal properties as natural areas that provide natural buffers and reduce flood risks for nearby properties. This has already been occurring in the wake of Superstorm Sandy and other natural disasters but will be an increasingly important tool to protect populations from climate displacement. These programs should also balance maximizing the social and economic cohesiveness of low-income neighborhoods with the need to protect surrounding areas from climate impacts. When climate displacement occurs, local, state, and federal governments should consider a variety of options to get people back into their homes as quickly as possible. Funding for temporary housing can help people survive the immediate impacts of extreme weather, but programs that enable fast repairs that make homes and rental units habitable are key to helping people return home more quickly. The U.S. Department of Housing and Urban Development, or HUD, should strengthen its Community Development Block Grant – Disaster Recovery, or CDBG-DR, program to ensure fair distribution of disaster recovery funds to low-income communities. HUD can do this by directing home-recovery programs using CDBG-DR funds to use a distribution formula based on the cost of repairs, rather than on the value of homes, to ensure that low-income people with less valuable properties are not shortchanged. Finally, governments should make greater efforts to track and locate the climate displaced. This information can be used to more efficiently direct necessary health benefits, disaster assistance, or other public benefits for populations uprooted from their homes. There is a precedent for this: After Hurricane Katrina, the U.S. Bureau of Labor Statistics tailored its monthly Current Population Survey, or CPS, to help determine the location and demographics of Katrina victims without revealing their personal information. Using a similar methodology, the CPS could be used following other major disaster declarations to help identify where the displaced are and direct health, housing, and other resources to areas with an influx of people fleeing extreme weather events. These recommendations are not simple tasks, but they will be increasingly needed as a changing and more volatile climate outpaces aging levees, dams, and other infrastructure. 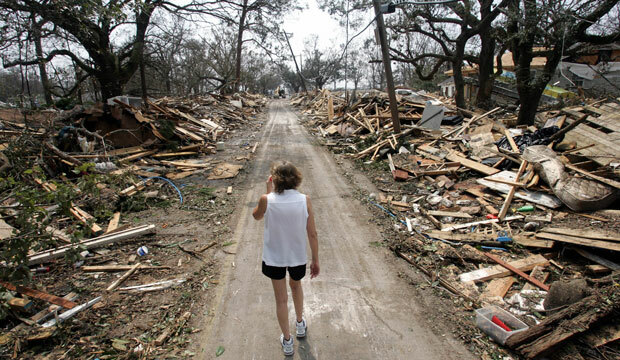 As the country honors and remembers those who lost their lives and homes in Hurricane Katrina on this 10th anniversary, we owe it to them and future disaster victims to respond to the needs and concerns of the growing ranks of the domestic climate displaced. Danielle Baussan is the Managing Director of Energy Policy at the Center for American Progress. Special thanks to Research Assistant Miranda Peterson, and interns Billy DeMaio and Hannah Flesch for their contributions to this issue brief.